Free Fringe act John Kearns won the 2014 Edinburgh Comedy Award for his show, Shtick, at the Voodoo Rooms. 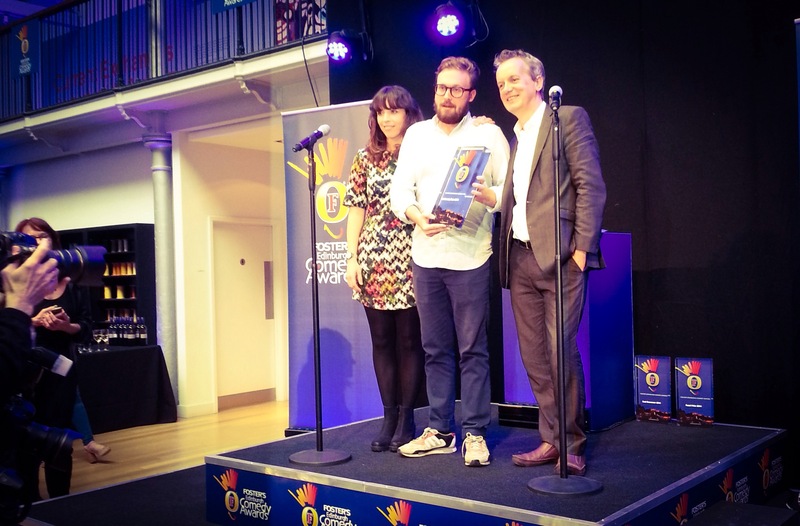 A tearful Kearns, who won last year’s Best Newcomer, was presented with his award at Dovecot Sudios in Edinburgh today by Frank Skinner and last year’s winner, Bridget Christie. Accepting his prize, Kearns said: “I wanted to come back and show I could do it again. I think it’s a better show. “I’m doing the Free Fringe, and this year some people have found it difficult. The Fringe has to change, something has to happen. Good comics who work hard… It’s difficult, and venues need to help those people. Sara Pascoe, Romesh Ranganathan, Alex Horne, Liam Williams and Sam Simmons were also up for the £10,000 prize. In the Best Newcomer category, Alex Edelman triumphed with his hit show, Millienial, taking home £5000. And Phil Ellis’ children’s show Funz and Gamez scooped the prestigious panel prize after the panel were inundated with requests to see the show from other comics. He also takes home £5000. Will Duggan, Mick Ferry, Tom Short and James Meehan of Best Newcomer nominees Gein’s Family Giftshop also starred in the show.